Is this correct? Should I put the address of the US embassy? 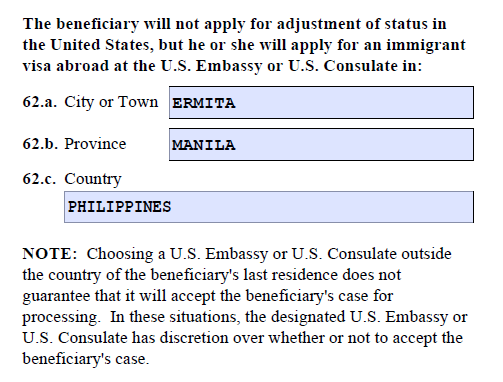 Is it ok to apply CR1 visa even we haven't seen each other for more than 1 year? He visited my country 5 times already but we're saving money now for the application. Sure you can file but you need to present the best petition of a bona fide marriage going forward. Based on your other posts I have concern over the other evidence. Things like adding the beneficiary to insurance, having powers of attorney for each other, etc. Chat logs and sending money doesn't show much of being married in the Philippines. I sent money to my g/f in Bohol before we were married. Chatted every day. You do realize that you will most likely need a joint sponsor at the NVC stage? A year is a long time away from each other. How long have you been married? My wife and I were apart for a year after we filed for CR-1. Yes, we're prepared for the joint sponsor. We got married January 2018, and he's planning to visit in May this year. But he's been in my country 5 times before that. The main thing you need is evidence of a bona fide marriage and a continuing relationship. You might not have a joint bank account, but chat logs, pictures, evidence of time spent together are important. You need evidence of the marriage and for the period after you married. Yeah, that's what i'm thinking about. We've been in a relationship for 4 years now, 1 year married so many evidence already pictures and stuff. but after marriage is more important. 😢 Guess we have to wait for him to come before we file the papers. I wouldn't wait to file the I-130. Couples who live in different countries aren't expected to have joint accounts or a lot of legal documents....but you can submit your marriage certificate, pictures, continuing relationship documentation.....then work to build stronger evidence for NVC and the consulate....just my opinion..